These guys continue to impress me with the amount of detail. The problem is that I keep having to go back as I block in the base colors because I find I keep missing this or that little detail with a color I thought I was finished with. This has added some time to the painting process, but I want to get them looking as good as I can. 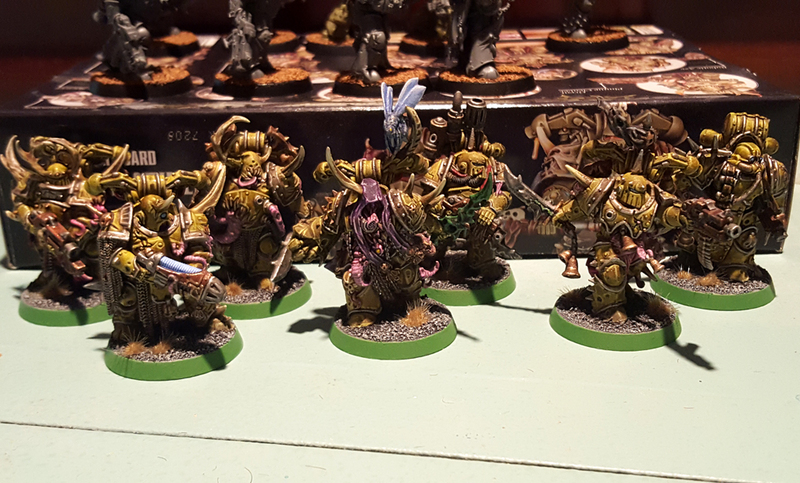 There is quite a diversity among the Plague Marines as far as their armor goes. I did use a lot of the same helmets – I did that without even thinking about it. 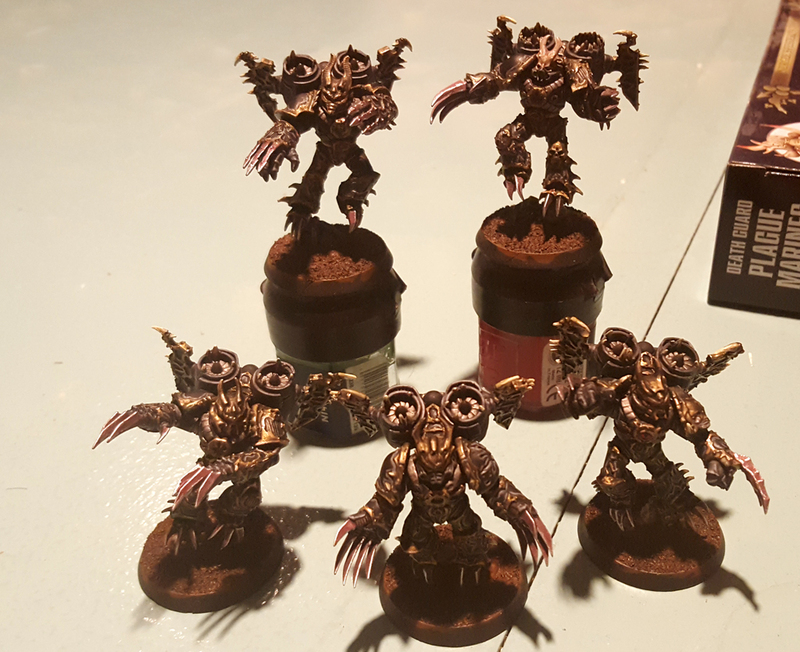 I was able to finish my unit of Warp Talons and get them varnished. I have to say, while the detailed Chaos Space Marine models look very cool, they also take quite some time to paint thanks to that same detail. It’s a bit of work in getting models like this done. That said, I’m pleased with how these Warp Talons turned out. The Blighted Gold I used on the trim does make them stand out a little from my other Black Legion models. It’s definitely a darker, less red gold. For the varnish I used ‘Ard Coat and probably a bit too much of it. Even after a couple washes of Lahmian Medium the models still have some shiny areas. Kind of disappointing, but given how many sharp edges and points are on these models, I’d rather have them shiny than a bunch of areas with chipped off paint. I wasn’t able to get the white primer I needed right away for my next batch of Plague Marines. So I took a look at my shelf to see what stuff was still a work-in-progress and what needed updating. As it turned out, I had a set of Warp Talons I’d been meaning to complete, as well as a couple units I needed to add my base adapters to. I decided to get cracking on those rather than sit and wait until I could get the primer I needed. 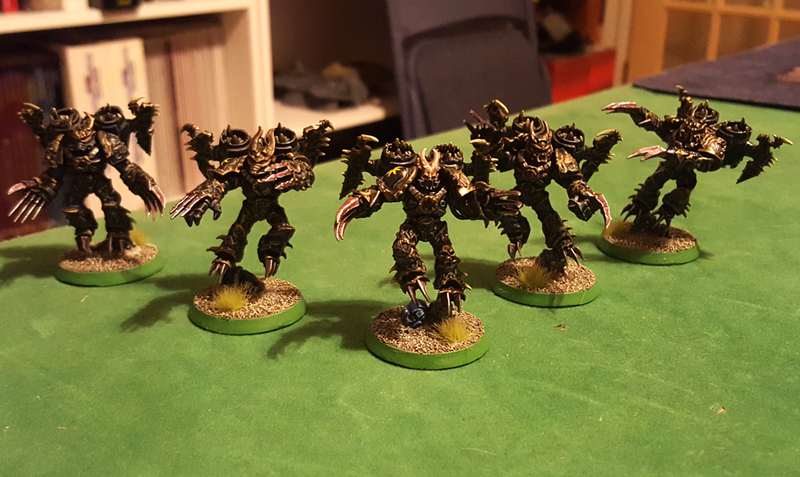 First up was my unit of Warp Talons. These guys were started back during the Fate of Konor campaign. I did them up in at least three colors just to score points during one of the painting challenges. They’ve been languishing ever since. But I’ve wanted to roll them into my Black Legion force and so I got working on them. I’d already done the base colors I needed as well as the washes. I just needed to do the highlights – though they are pretty detailed models which meant quite a bit of highlight work. It’s taken a while, but I finally got my first set of the new plastic Plague Marines finished. 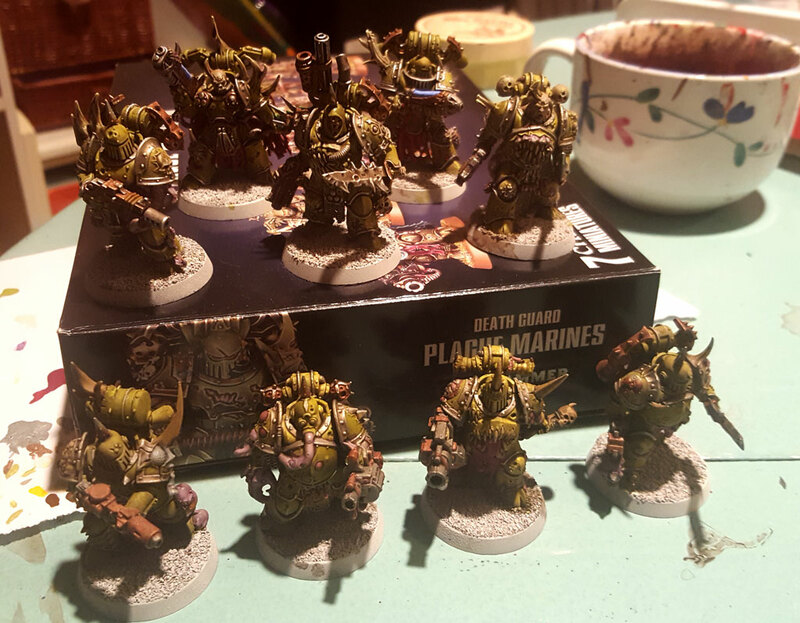 I should say, these are the Plague Marines from the Dark Imperium box set, not the multi-part kit. Still it’s nice to have them off the painting bench and ready for the table. As you can see from the picture, I’ve kept the motif of using Goblin Green on the rim of the bases. 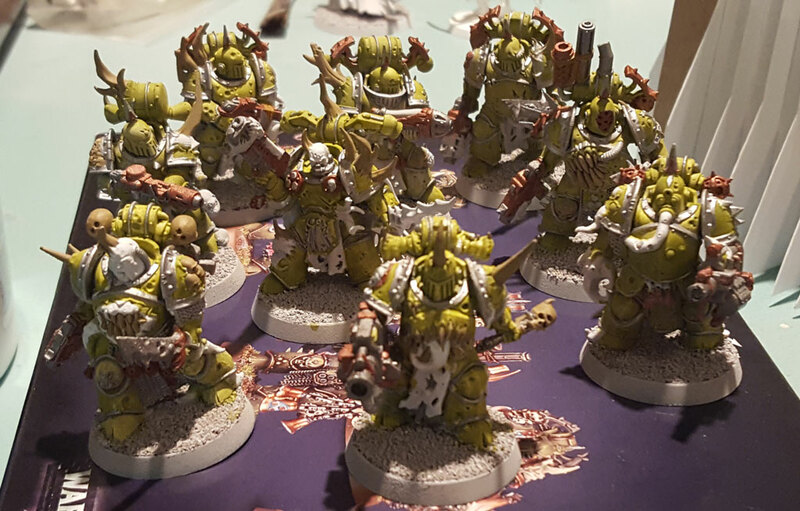 I realize some might say the use of green on the rim is old-fashioned, but I’ve used it on all my Chaos Space Marine models, and I wanted to keep that theme going in the new models. As far as the paint scheme goes, I found the Ogryn Camo paint to be an excellent highlight of the Vallejo GC Camouflage Green. I thought it did so well I didn’t do a second highlight for the armor plates.